It was as if the entire running community of NCR had taken this quote from Juma Ikangaa, the legendary marathoner, to heart this February Sunday. Runners of all shapes and sizes were pounding the asphalt at the crack of dawn. The running bug has truly gone viral ! Training for New Delhi Marathon on 26 February is in full swing, a few long runs already under the belt, the motivation of the first timer is sky high. Confident of completing the distance, the chatter has now moved on to achieving speed and projected finish timings. AAAh SPEED! The vision of running effortlessly like a cheetah inspires many a runner. Is increasing your speed just a case of going full tilt every time? 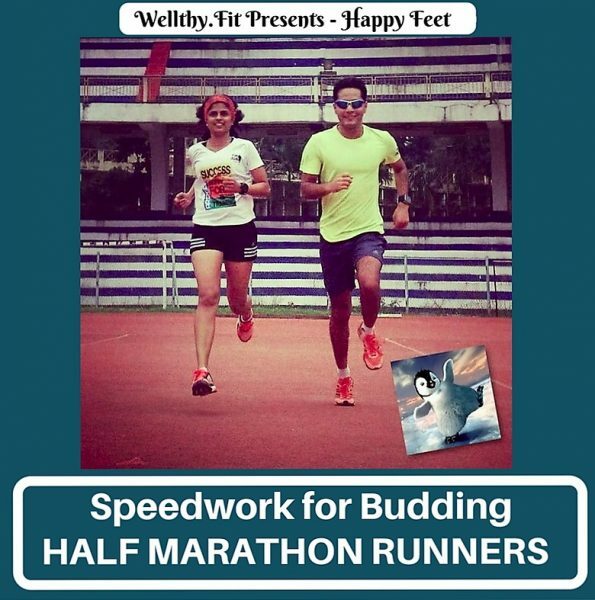 Truth be told – attaining speed is a carefully planned mix of speedwork, tempo runs, strength and flexibility training. Caution – the quest for speed is also a major cause of running injuries! Not more than one hard speedwork session per week. You don’t need more than this in your overall training schedule, afterall you are an endurance athlete ! Avoid over-striding. May lead to injury. Better to focus on high cadence with relatively short strides (more on this in other blogs on our website). Finish a session feeling as if you could have done one more sprint or interval. No point in getting laid up due to extended recovery time. Yes, running intervals is tough on your body. The Basics of speed work – Strides, Intervals and Hill Training. Strides. For starters, incorporate five to six runs of 30-40 secs at 80-85 % of your top speed post your regular runs. Keep your focus on form. Give a reasonable gap of 45 secs between the runs to catch your breath. This will improve your running form and prime you for the more grueling speed sessions ahead. Slow jog for 1 km plus dynamic stretches to warm up. Feed in your current timing and VOILA get your pace or time for each distance. Rest in between intervals for the same time you took to run it (many schools of thought on the ideal rest interval, but for starters this will do). Repeat the interval. The time taken for each interval should not be be +/- 5 secs from the designated pace. Not easy. The first interval may appear too easy while the last two will kill you ! So, choose your pace well. Rest and repeat to complete the designated number of intervals. Cool down by jogging for 1 km followed by stretches. Review after the run. Too slow a pace – the session translates into junk running miles. Too high a pace – you have and over-inflated opinion of yourself as a runner ! At the cost of repeating – choose your pace well. Increase the distance of the interval gradually. Fast intervals of more than 800m can be really taxing. Hill Training- Hills in NCR ? Yes, I can hear you ! For hills think Jahanpanah Forest, Sanjay Van, Bonta Trail, Aravalli Bio-diversity Park. If nothing look for stairs (stadiums, high rises). Avoid flyovers for safety reasons. Plan 40 sec to 1 min uphill runs at 70-80% of your top speed. Run tall with short strides and high cadence. Tough on your ankles and Achilles tendon so don’t overdo it. But the gains are so worth it. Basic Gyan over. It is now a matter of doing the deed. Most runners find speedwork to be the most difficult part of half-marathon training. Your lungs burn, aches and pains occur in body parts which you never knew existed. So easy to give up after the first two intervals. But YOU are made of sterner stuff! Do it right and the takeaways are phenomenally improved running for, speed and strength.